Smartphones and tablets may have replaced a daily newspaper for many of us, but saying goodbye to the morning gazette also meant losing those weekly circulars and a surefire way to keep track of when dish detergent's on sale. Thankfully, a new free app called Flipp, available for iOS today and Android early next year, promises to deliver all of those lost (but not forgotten) circulars directly to your smartphone or tablet. The team behind Flipp has spent the last couple of years not only developing a distribution platform that automaticaly delivers circulars to the app as they're updated, but also securing partnerships with all the major stores and chains across both the United States and Canada. 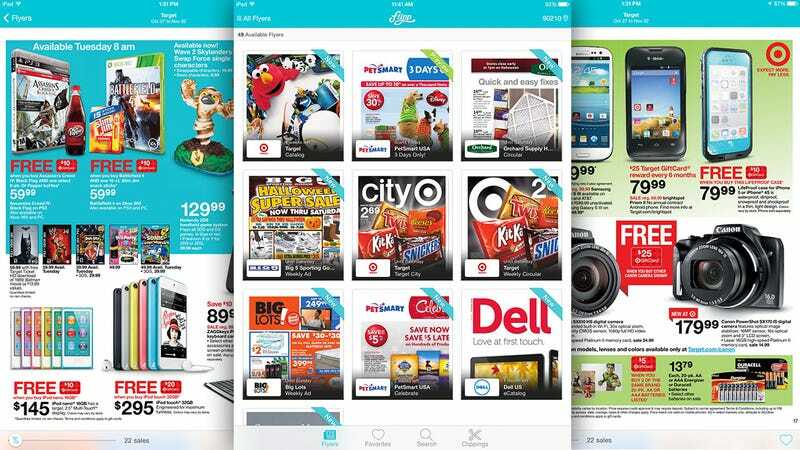 When it launches next week Flipp will include circulars from Target, to Walmart, to Pet Smart, and its creators are constantly working to expand who's included. After entering your postal code, or letting the app automatically determine your location, you're given a grid view preview of all the circulars available in your area. But that can be narrowed down either with a specific search, or filters that show you only sports, electronics, groceries, etc. Clicking on any of the circulars brings you a full page view of the ad, which can of course be zoomed and scrolled using standard gestures. As part of the import process, all of the items in a flyer are given individual hotspots so tapping on a specific product circles and highlights it—and even items in a group shot can be individually highlighted. Every item you select is collected and stored in a Clippings section of the app, making it easier to remember and track down those items when you're actually out shopping. Another particularly handy feature for those looking to save some real coin is a slider at the bottom of every circular that lets you specifically hunt for items on sale, or deals based on the percentage of savings. These items are highlighted as the rest of the circular's page is slightly darkened, making them easy to spot as you flip through the pages. For shoppers using Flipp across multiple devices, there's also an option to create an account that keeps your Clippings synced, so you can browse at home on a larger tablet and do your actual in-store shopping with your phone.